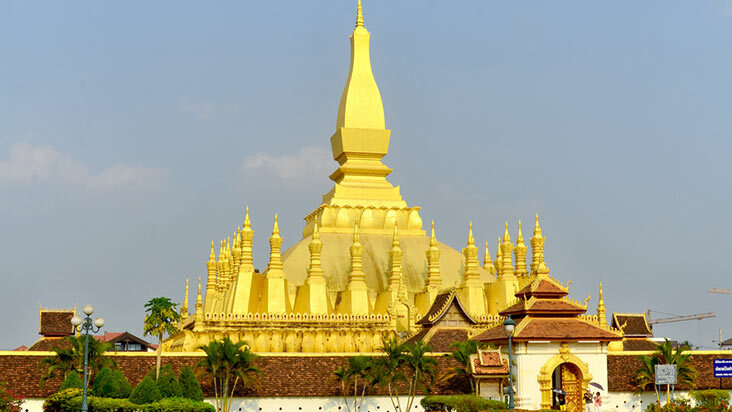 Travel the length of the country from Luang Prabang to Pakse on this Classic Laos trip. Begin your journey in the enchanting town of Luang Prabang with its stunning colonial architecture, ornate monasteries and colourful markets. 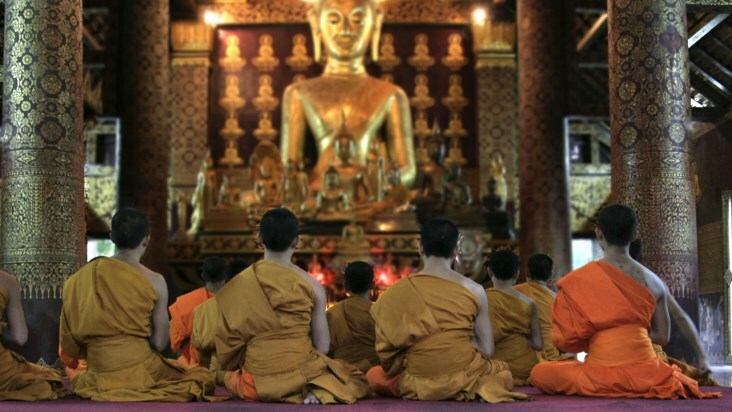 Rise early to witness the ancient dawn ritual of saffron robed monks collecting alms, discover the hundreds of Buddha sculptures in Pak Ou Caves, see the spectacular Kuang Si Waterfall and climb Phou Si hill to watch the sun sink slowly behind the Mekong river. Travel to the sleepy riverside capital of Vientiane with its alluring monuments and leafy boulevards, and discover the ancient atmospheric temples, the golden spires of Pha That Luang, the bizarre sculptures in Buddha Park and the beautiful textiles of the region. 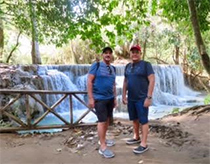 Then on to Pakse, to explore the beautiful region of Si Phan Don (four thousand islands) and the Bolaven Plateau, with its coffee plantations, minority tribal villages and some of the most spectacular waterfalls in Laos. Our Classic itineraries cover the key attractions with carefully selected experiences to ensure you get the most out of your holiday. Classic itineraries include time for relaxation or for adding extra activities. Discuss itinerary options and extensions with our Asia Travel Experts. Accompanied by your guide, start the day with a visit to the Royal Palace, now the National Museum. The former Royal Palace was built in 1904 and framed by an avenue of Palmyra palms, blending traditional Lao with French styles. The museum houses precious exhibits that used to be possessions of the Laos royal family. The royal family’s former residential quarters have been preserved as they were when the king departed in 1975. The royal palace car collection is displayed in a separate outbuilding. Late morning board the traditional Lao river boat to cruise upstream along the Mekong River to the Pak Ou caves in this full day shared group tour. From the boat, typical Laotian villages are barely visible behind thick foliage. Wooden canoes attached to bamboo poles bob by the shore while floats mark the location of fishing nets. The cruise is leisurely and the setting is peaceful. The Pak Ou Caves are dramatically located in a limestone rock formation opposite the mouth of the Mekong and Nam Ou rivers. The sanctuaries of Pak Ou consist of two large caves cut into the limestone cliff, revealing hundreds of Buddha effigies of various sizes and styles, from the tiny to the colossal and spanning many centuries. After visiting the caves, reboard your boat and cruise along the river. Lunch is served at the foot of the beautiful limestone cliffs, and consists of a selection of typical Lao dishes. After lunch the boat cruises back along the Mekong to Luang Prabang, arriving mid afternoon. Enjoy the remainder of the afternoon free to relax or explore Luang Prabang. Today sees you setting off with your guide to one of Luang Prabang’s most impressive and picturesque waterfalls, Tat Kuang Si. On the way stop off at Phosy market where you can observe locals trading in fresh produce. Across the street is Ock Pop Tock weaving centre which produces its own naturally dyed Lao silk and cotton textiles. Kuang Si is a multi-tiered waterfall, the falls beginning in shallow pools on top of a steep hillside, with the various cascades falling into clear turquoise pools. Walk through the National Park to the waterfalls and if you're feeling energetic, climb to their source and go for a swim. After a picnic lunch in the tranquil surroundings of the park, return to Luang Prabang and enjoy free time for the afternoon. Relax this morning before your flight today from Luang Prabang to Vientiane. Meet your guide on arrival, transfer and check-in to your hotel. During the drive your guide will provide an introduction to Vientiane, answer any questions you have, and make arrangements for the following day. Enjoy the afternoon to explore Vientiane. Vientiane has many great restaurants with Lao, Thai, French, Italian, Mexican and Chinese cuisines available. Ask your guide for personal recommendations. Enjoy free time for the remainder of the day. Today fly from Vientiane to Pakse in the far south of Laos and meet your guide on arrival in the airport, transfer and check-in to your hotel. Your guide will provide a quick introduction to the Pakse area, answer any questions you have, and make arrangements for the following day. Enjoy free time for the remainder of the first day. Founded by the French in 1905, Pakse sits at the confluence of the Mekong River and Se Don (Don River) and is the riverside capital of Champasak Province, featuring Franco-Chinese architecture. It is the gateway to the south and to the four thousand islands of Si Phan Don, an archipelago of islands set amongst a beautiful maze of waterways and home to the elusive Irrawaddy dolphin. Nearby the Bolaven Plateau, formed by an ancient volcano, offers cooler climes and the chance to discover tea and coffee plantations, minority tribal villages and some of the most beautiful waterfalls of Laos. Fresh produce grown here is sold in the colourful market in Pakse. The Khmer-Hindu archaeological ruins of Wat Phu although on a much smaller scale, are said to rival those of the ancient temples of Angkor. Pakse has a good choice of restaurants with Lao, Thai, Vietnamese and western cuisines available. Ask your guide for personal recommendations. Accompanied by your guide, head south towards the Cambodian border to visit the Khone Phapheng waterfall. The falls are the main reason why the Mekong River is not navigable up to China. 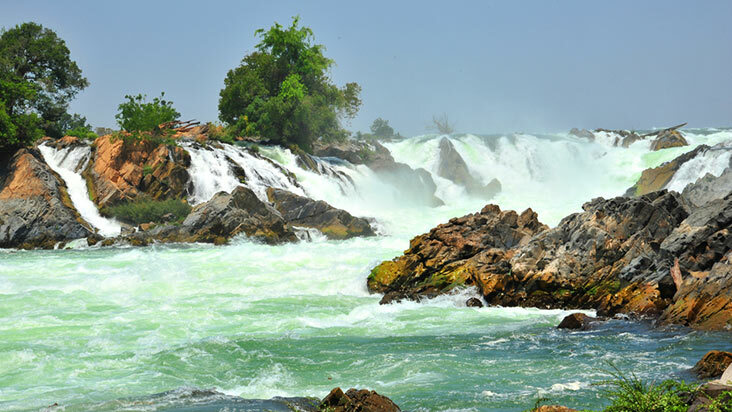 The falls cover an impressive 10 kilometre (6 mile) stretch of the Mekong River creating a majestic sight that is a highlight of southern Laos. 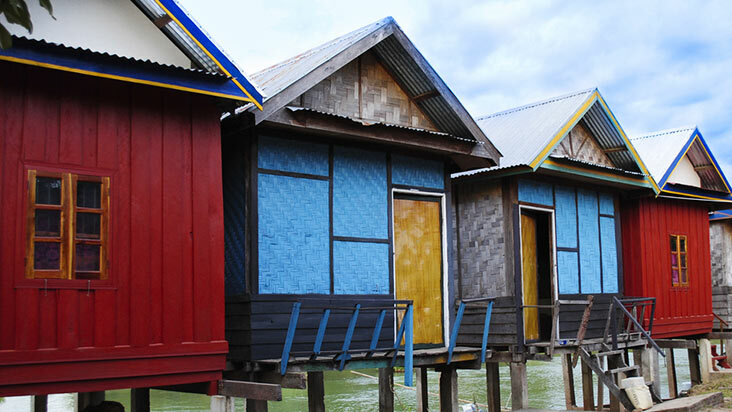 Continue to the pier at Ban Nakasang and board a local boat for a visit to Si Phan Don. This section of the Mekong River fills out during the wet season, becoming the widest reach along its extensive 4,350 kilometre (2,720 mile) journey from the Tibetan Plateau to the South China Sea. During the dry season the river recedes and leaves behind thousands of islands and islets, some mere sand bars, hence the name Si Phan Don, meaning four thousand islands. Several of the permanent islands are inhabited with the village communities growing rice, sugar cane, coconut palms and vegetables. Make a stop at the island of Don Khon, which features the remnants of the French colonial area including an old pier, a railway station, a former French hospital building and the maritime office. Enjoy lunch before continuing your exploration of the island. In the afternoon visit the Liphi waterfalls, nicknamed the Corridor of the Devil. Locals put fish traps at the bottom of the falls to catch fresh fish each day. The area is also home to the rare and endangered freshwater Irrawaddy dolphin. These dolphins are dark blue grey in colour with bulging foreheads and small dorsal fins. Return to the mainland and transfer back to your hotel at the end of the day. With your guide, explore the Bolaven Plateau, a fertile highland area formed by an ancient volcano and famous for its high grade coffee and tea plantations. It is home to a number of ethnic minority groups and tribal villages, some of them still practicing Stone Age culture by using primitive agricultural tools and conducting spiritual ceremonies. The largest ethnic group found on the plateau is the Laven, and other groups include the Alak, Katu, Ta-oy and Suay. 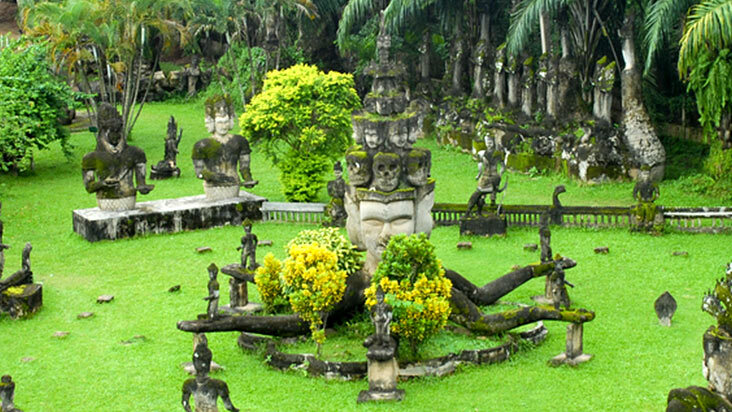 Visit Tad Lo, located on the northern edge of the Bolaven Plateau. This waterfall is in fact a series of three falls, namely Tad Suong, Tad Lo and Tad Hang. Continue to the Katu village of Ban Houeihoun. This minority tribe is very primitive and earns its livelihood from forest products and traditional weaving. Katu villages have their palm and thatch houses arranged in a circle, and the women are known for their face tattoos. The Katu people have the unique custom of carving wooden caskets for each family member during their lifetime and storing these under the houses or rice sheds. In the afternoon, visit Paksong and the nearby Tad Fane waterfalls where lunch is served. Beyond the waterfall stretches the extensive jungle of Dong Hua Sao from where the perfectly synchronized twin falls originate and plunge 200 metres (656 feet) down a deep gorge. Continue to Tad Yeung waterfall, which drops an impressive 42 metres (138 feet) and is surrounded by lush vegetation. End the day with a visit to a tea and coffee plantation and learn why the Bolaven Plateau an ideal area is for these plantations. Itinerary Option: Some customers prefer to visit Champasak and the UNESCO World Heritage pre-Angkorian Wat Phu temple. Pakse: Visit UNESCO pre-Angkorian Wat Phou temple. Pakse: Visit the island of Don Daeng, home to a number of pre-Angkorian ruins, Buddhist temples, an ancient forest stupa and a protected forest. Pakse: Trek Phou Khong Mountain with overnight homestay in Ban Mai Singsamphan. Pakse: Tree Top Explorer 2 or 3 day adventure trips that include canopy walks and zip-line traversing steep gorges. This trip package includes 2 internal flight (Luang Prabang - Vientiane and Vientiane - Pakse) which retail at about 200AUD per flight.